224 Seiten, 206 meist farbige Abb. Der Band zeigt eine Auswahl von Werken aus den Samm­lungen des Staat­lichen Museums Schwerin zur Kunst in der DDR, die ein breites Spektrum an künst­lerischen Positionen vorstellt. Die präsentierten Gemälde, Plastiken, Zeich­nungen und Grafiken eröffnen neue Perspektiven jenseits der verordneten Staats­kunst und widmen sich den leisen, aber kritischen Stimmen. In ihrer Verweige­rung von ideolo­gischen Vorgaben ermög­lichen auch traditionelle Gattungen wie Porträt, Landschaft und Stillleben einen unerwarteten Blick auf die DDR-Wirklichkeit. Träume, Sehnsüchte und Projek­tionen sind in den bildlichen und plastischen Werken wiederzufinden, die den Horizont nicht als starre Grenze, sondern als einen freien Vorstellungs- und Assozia­tions­raum erfahrbar werden lassen. In der Spannung von Intimität und Weltsicht entwickelte sich eine spezifische künstlerische Sprache jenseits von Stereo­typen des Sozialis­tischen Realismus. Diese fand auch in Aktionen und Performances ihren besonderen Ausdruck. Der reich illustrierte Katalog erscheint in deutscher und englischer Sprache. 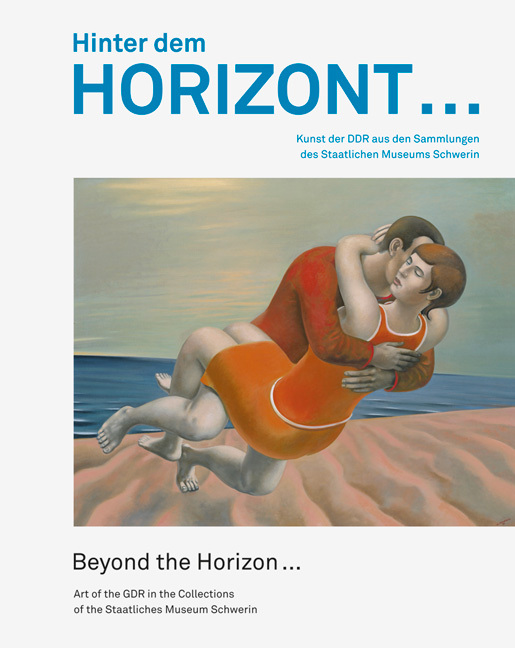 The catalog to the exhibition "Beyond the Horizon …" shows a selection of GDR artworks from the Schwerin State Museum’s collections, covering a wide range of artistic positions. The paintings, sculptures, drawings and graphics presented here open up new perspectives focus on the gentle, yet critical voices and thus point beyond the style of art decreed by the East German state. Even traditional genres such as portrait, landscape and still life, in their refusal to bow to ideological objectives, here offer an unexpected view of GDR reality. Its emphasis is on the artistic quality and the specificity of the Schwerin collection. Dreams, desires and projections are what come to the fore in these pictures and sculptures which make the horizon tangible, not as a rigid limit but as a space of free imagination and association. The tension between intimacy and world-view gave rise to a specific artistic language that went beyond the stereotypes of Socialist Realism and also found expression in actions and performances. A selection of exhibits from the Schwerin Mail Art archive shows that the Mail artist network then in existence facilitated a kind of a cross-border communication. Items on loan from artists such as Michael Morgner and Holger Stark give insight into Action and Performance Art with some reference to Mecklenburg. The richly-illustrated catalog will be published in German and English. Well-researched essays by historians and art historians demonstrate the importance and uniqueness of the Schwerin collection.